CEP #6506-GU TEMPORARY POWER DISTRIBUTION BOX, GFCI 50 AMP 125/250V. PRICE/EACH. CEP's "G" Series Portable Power Distribution Centers have been engineered utilizing the latest in GFCI technology, providing the user with the highest level of electrical safety. These power distribution centers are protected by a GFCI module giving the user open neutral and reverse phasing protection. They are U.L. 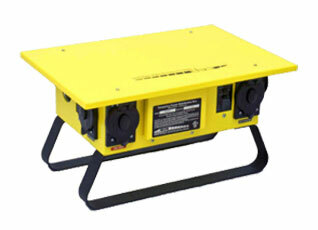 Listed for outdoor use and designed to stand up to the toughest of jobsite conditions. Each unit has been carefully assembled to provide the ultimate in electrical safety as well as meeting current OSHA standards. GFCI's provide both open neutral and reverse phasing protection for 120V outlets. INLET: CS6375 50 AMP 250V INLET. Also #6506G, available with 6 L5-20R twist locking type receptacles. And #8706G or GU with full roll frame around box.